Published 2017 by Walker Books. I will start at the end of this tale. A wolf sits and howls at the moon, “Oh woe! Oh woe!” because he is a very woeful beast indeed. And the reason he feels so sorry for himself is because inside his stomach a duck and a moue are having a disco in the place that they like to call home. 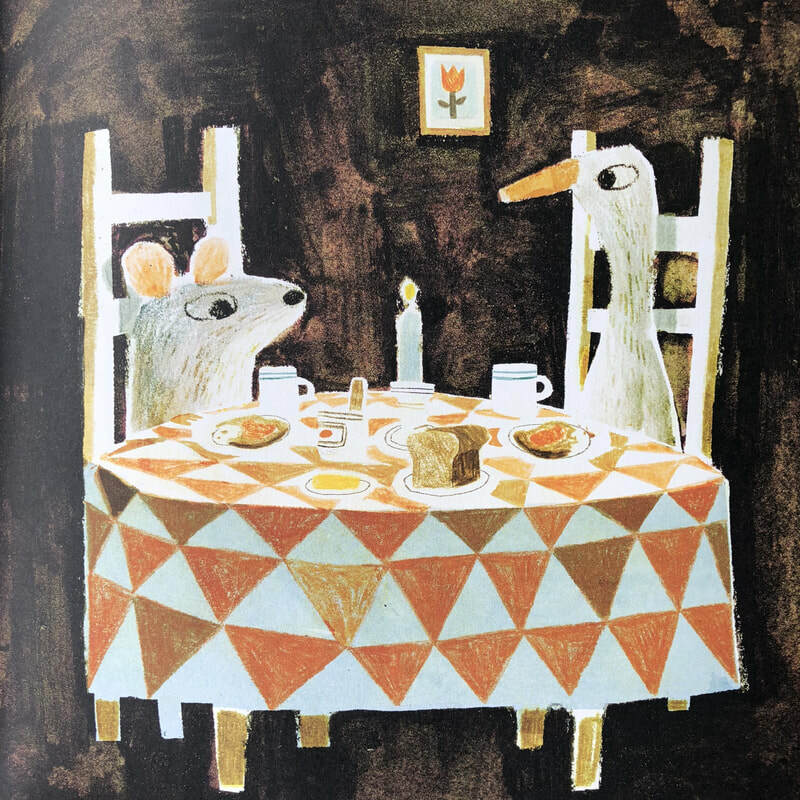 ​For the duck and the mouse, it was a chance encounter for they both were both swallowed by the wolf at the same time and whilst the mouse thinks it is the end for him the duck has no intention of being eaten. In fact, he has decided to make the best of the situation as he is now in a safe place and doesn’t need to be worried about constant threat of wolves anymore. All is fine for the two squatters and they live a comfortable life inside the wolf until the wolf becomes the hunted and needs to run for his life. Once entangled in the forest undergrowth the wolf is trapped and easy prey for the hunter. His inhabitants take it upon themselves to protect their host and chase the hunter away. 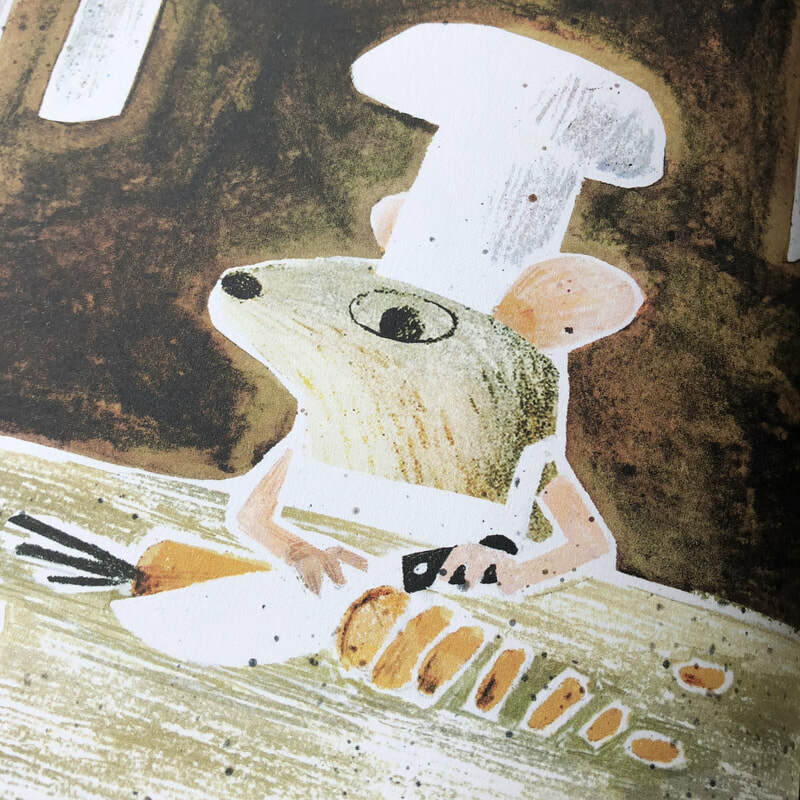 Readers will enjoy the image of the mouse, astride the ducks back, flying out of the wolf’ mouth wearing his cooking pot helmet and brandishing his hockey stick as a weapon. Once they have chased the hunter away, the wolf bows down in thanks to the mouse and the duck pledging to grant any request that they have. This is reason why the wolf sits howling at the moon, “Oh woe! Oh woe!” because there are two small creatures having a disco in his stomach. Mac Burnett tells a wonderful story which, due to the traditional characters who feature, has a fairy-tale feel about it that is reinforced by the traditional language used. 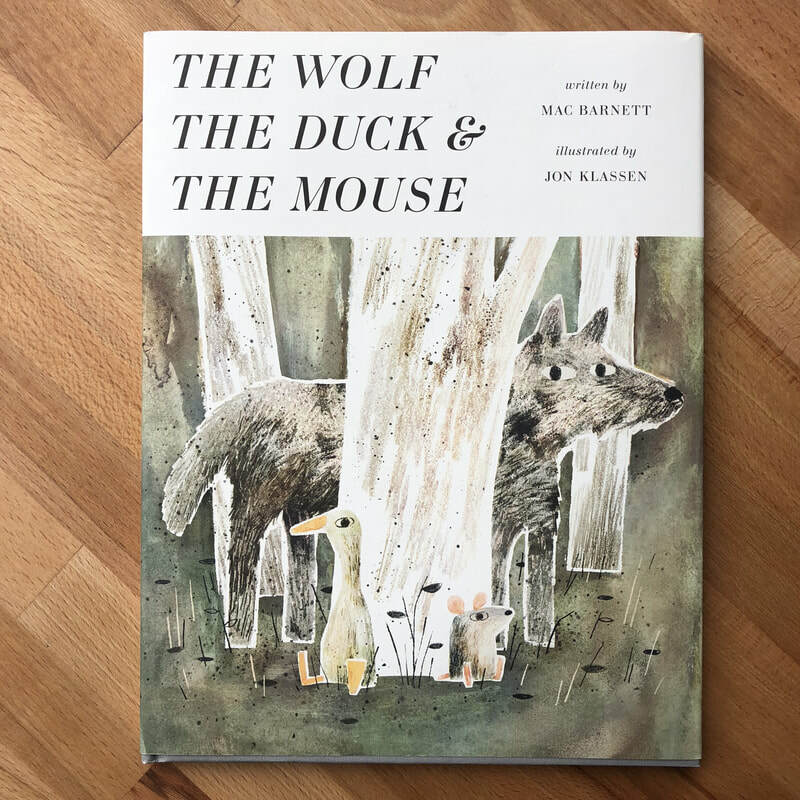 The fable explains why the wolf howls at the moon but also teaches the reader that those of us who have a positive and flexible outlook on life will flourish – just like the duck. Klassen’s artwork complements the story perfectly, he leaves behind the minimalism of ‘Triangle’ and ‘Square’ and adopts a more ‘painterly’ style. 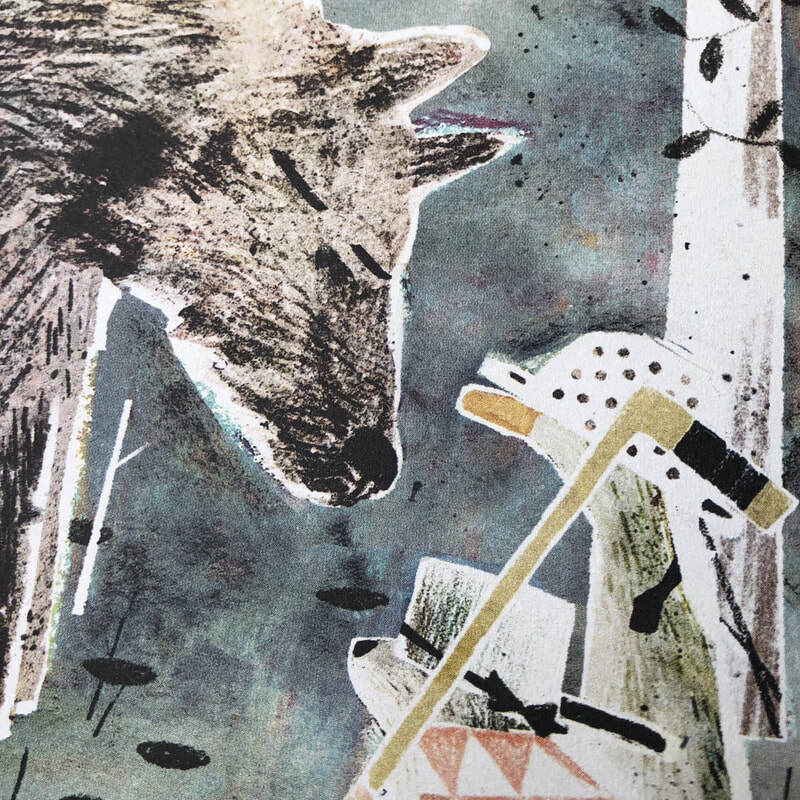 The wolf has a look of Klassen’s fox in ‘Pax’ by Sarah Pennypacker but he seems to be a little less refined. There is little doubt in my mind that this book is worthy of its place on the shortlist on the Klaus Flugge Prize. This book takes the form of a fantastic narrative poem. Mouse is timid and meek. So small that no one ever notices him. Mouse knows he needs to be more like Lion so he summons up the courage to talk to Lion 女 but when Lion awakes he’s in for a shock for Lion is scared of mice! That day they both find out that no matter your size we all have a 女 and  inside. ​Find this book on Amazon here. An adventure told through pencil sketches. This beautifully illustrated almost wordless book tells a rip roaring adventure of one brother and sister in search of a giant whale. Newspaper cut-outs set the story and the children set out to prove that the whale exists. The two children build their own boat but sadly all is not plain sailing. 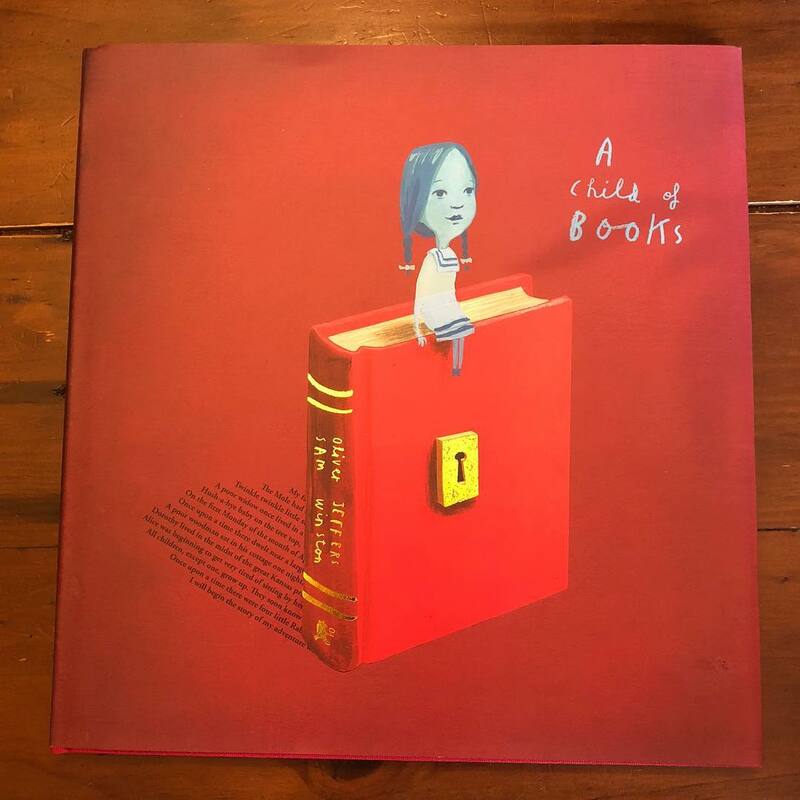 A Child of Books by Oliver Jeffers and Sam Winston. A child of books can float upon their own imagination. They can travel over ‘mountains of make believe’ and ‘discover treasure in the darkness.’ The book explores all of the fantasy lands which a good book will create for its reader. 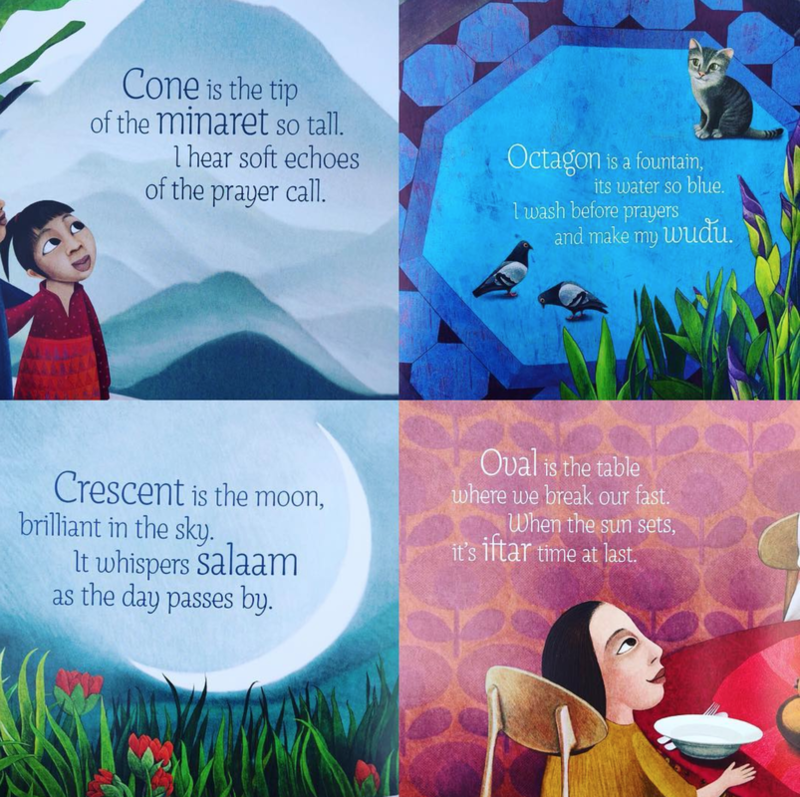  A beautifully illustrated book to share when telling children about the magic of books. 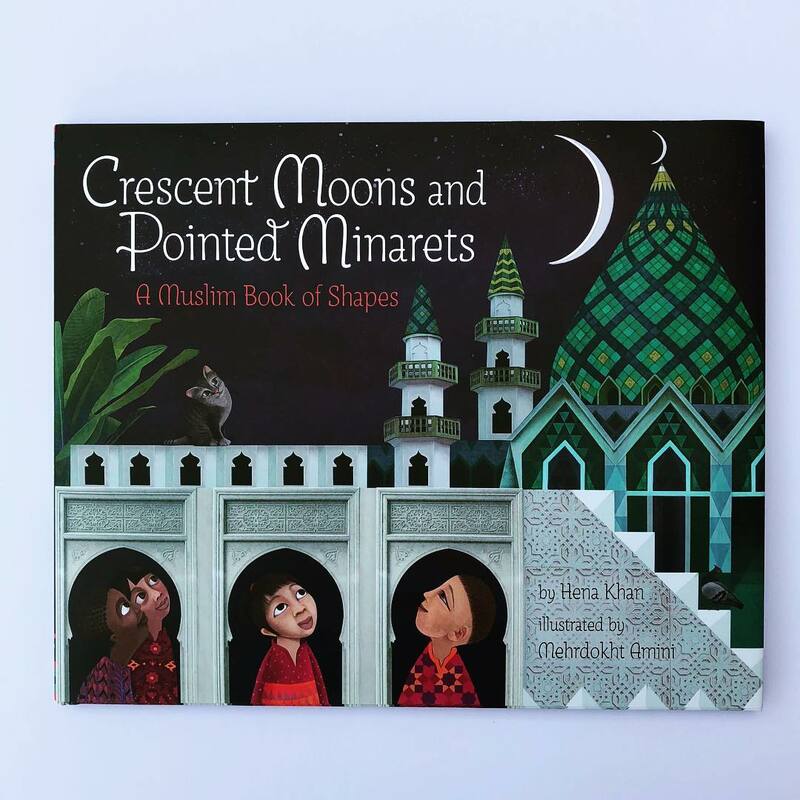 I’ve just finished ‘Crescent Moons and Pointed Minarets’ courtesy of @chroniclebooks. ​It is a great book which ties together elements and symbols of Islam with mathematical shapes. For example, octagon is the pool in which to wash for Wudu, circle is a daff and hexagon is a tile painted with an ayah. his would be a great book to share with younger children who are learning about shapes in maths and/or about Islam in RE. Applause to the ingenuity of its author Hena Khan. Everything you need for a treehouse. I always wanted a treehouse but never had one! 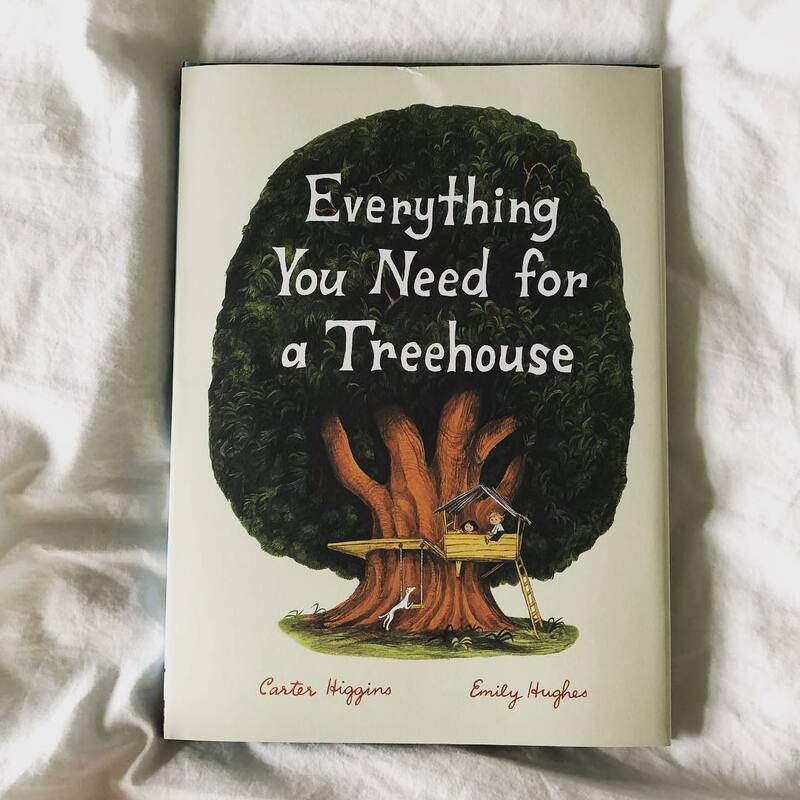 I should have read this wondrous book by Carter Higgins and Emily Hughes. as then I would have known that everything I needed was all around me. I just needed some time and to look up! This book is a poetic, nostalgic romp through the woods into every adventurer’s childhood soul. 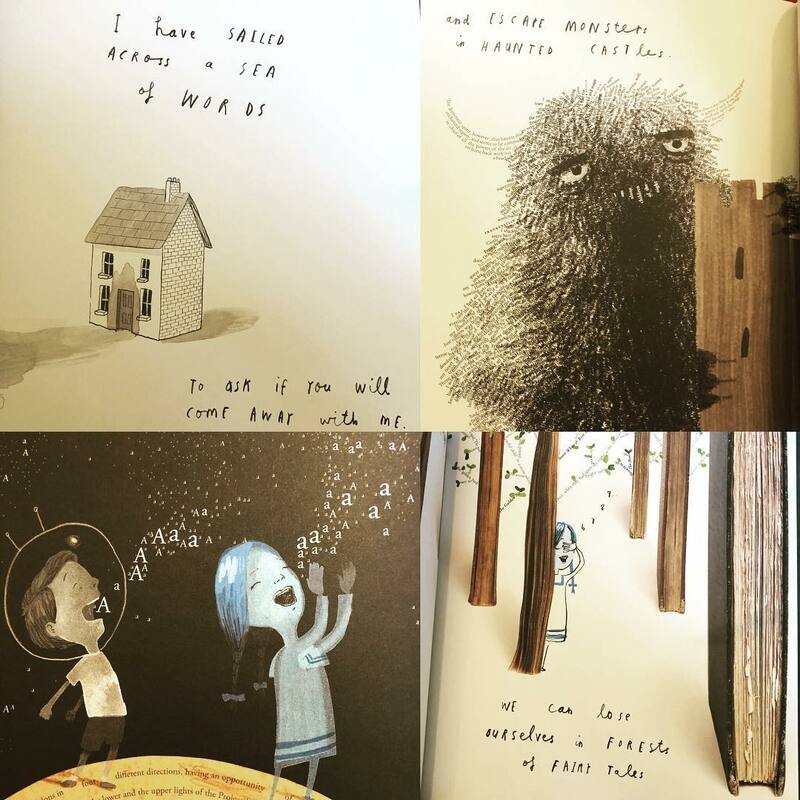 Wonderfully illustrated, it evokes a timeless fantasy of escapism that will bring joy to young and old alike. Enjoyed this one and I'm sure children aged 10-11 plus will too. When Albie’s scientist mum dies of cancer. Albie vows to see here again when he hears about parallel universes. With the aid of his neighbours cat, a quantum computer, a Geiger counter and a decomposing banana Albie travels to various parallel worlds to try and find one in which his mum is still alive. ​Funny at times, heartbreaking at others but ultimately heart-warming. A great addition to any class library! We’ll definitely be picking up @christopheredge’s other adventures. Ethel Leatherhead is a 12 year old girl with acne. She has tried everything to get rid of her zits but nothing has worked, until a combination of Chinese medicine and some time in a second hand sunbed make them disappear. In fact they make everything disappear.... Ethel Leatherhead becomes invisible. 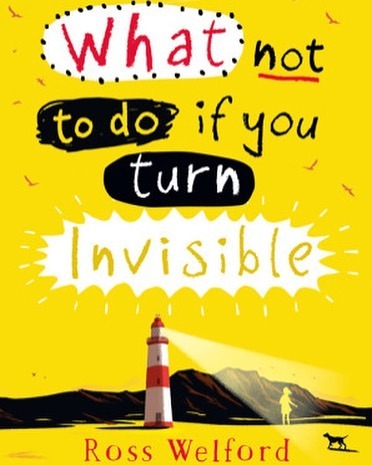 Being invisible can be fun but when Ethel’s secret is discovered by, the deliciously named twins Jesmond and Jarrow Knight, then being invisible becomes infinitely more onerous. ​@rossswelford has produced another corker! Find this book on Amazon here. 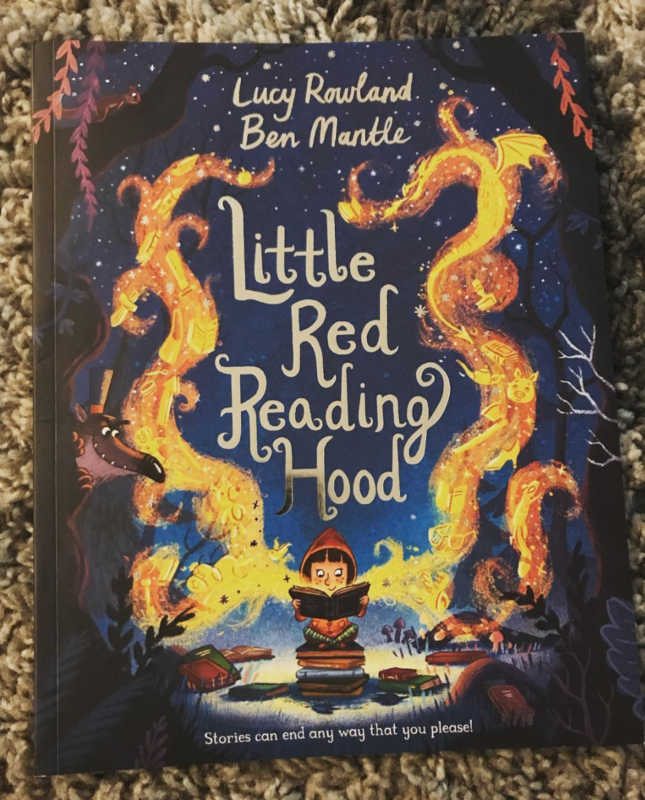 Little Red Reading Hood by Lucy Rowland and Ben Mantle. Little Red Reading Hood loves books, she isn’t going to her grandmother’s house but off to the library. The wolf meets her there - he has done away with the librarian. Little Red helps him see the error of his ways through the magic of books. Recommended for all children in the primary range.